Obituary for Olga (Sica) DeRanieri | Shore Point Funeral Home and Cremation Services, Inc.
Olga DeRanieri, 92, of Hazlet, New Jersey, passed away peacefully on Saturday, April 7, 2018 at Regency Park Nursing and Rehabilitation Center. She was born Olga Sica on June 7, 1925 in Brooklyn, New York, where she grew up and raised her family with her husband, Bruno. In 1999, Olga moved to Staten Island, New York and in 2017, settled in Hazlet, New Jersey. She was predeceased by her parents, Alberico and Teresa (Gargano) Sica, her beloved husband, Bruno DeRanieri, and 6 dear siblings. 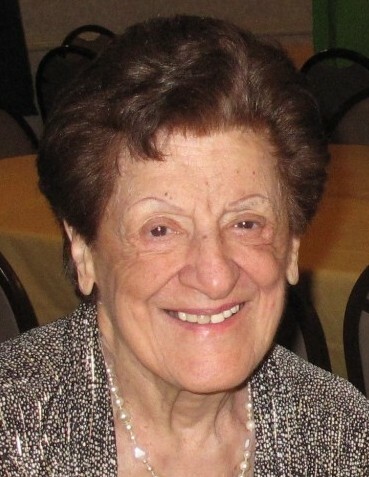 Olga is survived by her loving children, Joseph DeRanieri and his wife, Debbie, of Brooklyn, New York, Theresa Faro and her husband, Lou, of Monroe Township, New Jersey, and Maria Roldan and her husband, Jimmy, of Parlin, New Jersey, and her cherished grandchildren, Kathleen Ciaio and her husband, Chris, Melissa Begin and her husband, Patrick, Brian Rivera, Robert DeRanieri and his wife, Kristen, Jason Rivera and his fiance, Liz, Christopher Roldan, and Jill Leone and her husband, Peter, along with her adored great grandchildren, Piper Ciaio, Tyler Begin, Samantha Begin, Avery Begin, Peter Leone Jr., and Julia Leone. Olga will be deeply missed, but never forgotten. Family and friends are invited to visit on Tuesday, April 10, 2018 from 3:00 to 5:00 and 7:00 to 9:00 PM and Wednesday morning, April 11, 2018 from 8:45 to 9:30 AM at the Shore Point Funeral Home and Cremation Services, Inc., 3269 State Highway/Route 35 North, Hazlet, New Jersey 07730. A Mass of Christian Burial will be offered on Wednesday morning, April 11, 2018 at 10:00 AM at St. Benedict Roman Catholic Church, 165 Bethany Road, Holmdel, New Jersey 07733. Interment will follow at St. John's Cemetery, 80-01 Metropolitan Avenue, Queens, New York 11379. For information, directions, or to send condolences to the family, please visit, www.shorepointfh.com.